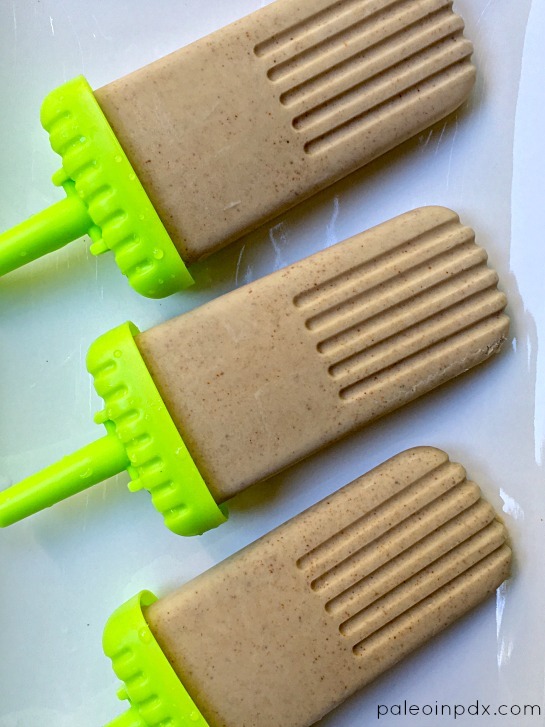 This banana almond butter popsicle is incredible in a classic kinda way and SO creamy. Like, insanely creamy and totally dairy-free too. No sweetener of any sort is needed either, as the banana adds enough on its own. I think these are sure to win over kids and adults alike. Between these and the chocolate mint popsicles, I’m in popsicle heaven. Each day, I look forward to grabbing one out of the freezer and enjoying it out in the sunshine. I used these molds, which yield six popsicles, but there was enough mixture for seven (I actually have two sets of the molds too, so no issues for me there). I recommend the following options if you have extra, but are out of molds: 1). drink it, 2). pour it into a little dish or jar and freeze (then scoop out and eat like ice cream), or 3). pour into a paper cup and add a popsicle stick mid-way through freezing. Also, as I mentioned in my previous post, I’m gearing up to do a popsicle segment in a couple weeks on KATU Afternoon Live and need to have a few options to present. This is one of three that I’ll be sharing! UPDATE: watch the replay of my KATU Afternoon Live popsicle segment HERE. Place all ingredients in a high speed blender and blend until smooth, scraping down the sides as needed. Pour into popsicle molds and freeze for 6-7 hours or overnight. Once ready, rinse mold under hot water to remove. Thanks for sharing, Alisa! Can’t wait to try these. They sound and look amazing! Thanks, Carmel! I appreciate you taking the time to check out the recipe and leave me a friendly comment 🙂 The popsicles are definitely amazing and I hope you enjoy them!